Home / ScanBalt and the Healthy Aging Network Northern Netherlands test Digital Health online courses with elderly in Groningen. 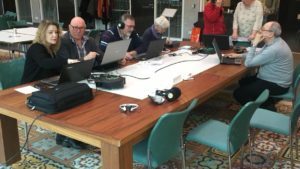 ScanBalt and the Healthy Aging Network Northern Netherlands test Digital Health online courses with elderly in Groningen. Allette Snijder, ScanBalt and HANNN, has worked intensely in a co-creation process to establish massive open online courses (MOOCs) aiming to improve digital health literacy for elderly. The 13th of March the Dutch specific course developed in the H2020 project IC Health was tested on elderly in Groningen. The participants were interested and actively engaging providing very valuable input to the MOOCs. To fully benefit from new technologies it is crucial to enhance EU citizens’ skills on how to search, understand and appraise online health information. At the same time it is a pre-condition for the uptake of new innovative solutions and enlargement of the market. IC Health is an important contribution to a digital agenda for the Baltic Sea Region/Northern Europe and is financed by Horizon2020. ScanBalt is a partner in IC Health. IC-Health will provide support for the improvement of digital health literacy in Europe. In particular, the project will design 35 open access online courses (MOOCs), in seven different national languages, for different population cohorts including children, adolescents, pregnant and lactating women, elderly and people affected or susceptible to be affected by type 1 and type 2 diabetes. The identified population cohorts, along with health professionals, academics and other practitioners, will be organised in Communities of Practice and involved directly in the co-creation of the MOOCs content and structure. Once the courses are be designed, they will be tested by the members of the CoPs and by other users. MOOCs use and impact will be monitored and assessed in order to ensure their uptake and sustainability beyond the duration of the project.